Adaptrade Builder can discover, code, and test thousands of unique and complete trading strategies in minutes. 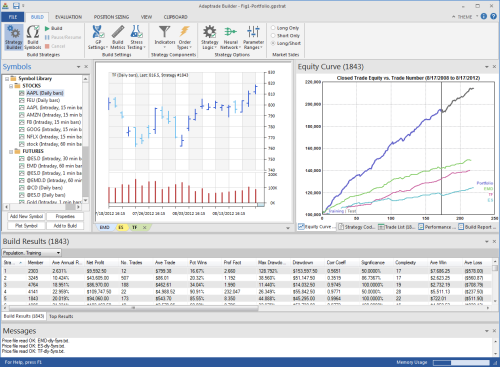 Builder can discover and code trading systems for stocks, futures, forex, ETFs, and other markets on time intervals from tick data to monthly bars. Adaptrade Builder uses advanced genetic programming technology to construct an almost unlimited variety of unique trading strategies based on your specific requirements. Builder does the programming for you. You just select the price data for your target market or markets, tell the program what you want the final strategy results to look like, and Builder does the rest. If you know a good trading strategy when you see one, you can use Builder to generate the kinds of strategies that will work best for you. Builder generates complete trading strategy code. Just copy the code to your trading platform. 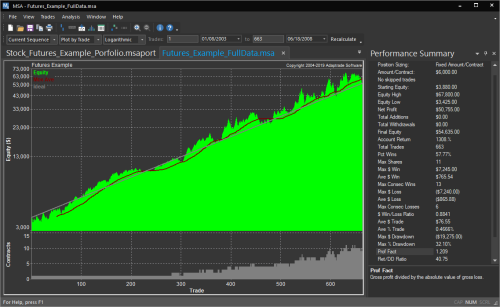 Creating custom trading strategies has never been so easy. Raise your percentage of winning trades. Learn when to stop trading during drawdowns and when to start up again. Discover profitable win/loss patterns in your trading and learn how to exploit them. Measure your trading performance more accurately using Monte Carlo analysis and significance testing. With MSA you can gain confidence in your trading by identifying the unique strengths and weaknesses of your trading system or method and adapting your trading accordingly. Use Market System Analyzer to realize your full potential as a trader. MiniMax is a versatile end-of-day trading system based on volatility breakouts and price patterns. MiniMax has been updated to trade the forex markets. In addition to trading a variety of commodity and financial futures, including E-mini S&P, mini Russell, E-mini crude oil, T-Bonds and gold, MiniMax can now be traded on the EURUSD, AUDUSD, and USDJPY currencies (forex). Unlike most systems that trade a diversified portfolio of markets, MiniMax has a fairly short holding period. It typically holds trades for a few days to about two weeks. The system runs on daily bars and, unlike day trading systems, does not require watching the market all day.